Some leagues use a first come, first serve policy. This can cause problems with multiple owners that live in different time zones or have various work schedules that do not line up with when players become available. This causes come owners to horde players as they notice the team they are playing doesn’t have a starting kicker, so they grab two or three off the wire. Is that how the NFL or you would want that handled? There are other leagues that do a worst to first setup; which allows the player to go to the worst team, if they chose to go after them. The problem I have with that set up is it rewards mediocrity. In most dynasty leagues, rookie drafts are held with the worst to first principle as they should, but owner activity and budget management should get rewarded too. I believe blind bid waivers offer everyone the equal opportunity to get a player on the waiver wire that they need. So how does blind bidding work? Each owner in a league gets a specific amount of money to spend for the year or a certain time period (I am in a league that has an in-season bank and an off-season bank, shout out to Ghosty!). For the sake of ease, let’s say that amount is $100 (this can be real money that got included in your entry fee or an amount that doesn’t carry over from year to year, depending on the league). The individual owner decides how much they are willing to spend on acquiring a certain player. For example, in a league where I made cuts early, my team was in some dire circumstances at tight end with new Jacksonville Julius Thomas, Houston CJ Fiedorowicz, and free agent Jermaine Gresham. One of the players I cut back in February was New Orleans Josh Hill. 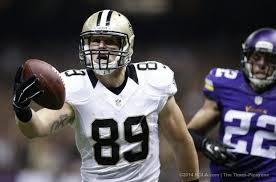 At that time Jimmy Graham was still a Saint, Thomas had not departed from Denver yet, and Gresham appeared to be heading to Oakland. A week ago I placed a 25% of my blind bid budget on Hill and got him in our first blind bid waivers period dropping the still free agent Gresham who may or may not be healthy. If new starting Saint tight end doesn’t perform, my team suffers with my judgement, and I have less opportunity to acquire the next interesting player. This offers strategy for some teams to spend money early, while other teams may hold their money for an even better possible player. This allows active owners to get rewarded for tracking who is on the waiver wire and who can improve their team by placing bids on the players that could help them win. The reason I do not play re-draft leagues is that chance gets rewarded just as much as skill. Dynasty leagues are more skill based because a good week or month doesn’t make the difference in building a championship level team that can compete for years.